We looked at the top 1 Jigsaws and dug through the reviews from 19 of the most popular review sites including BestReviews, Heathy Handyman, Woodwork Boss, A Concord Carpenter, Best of Machinery, Wood Magazine, Tool Box Buzz, Sympathink, All Saws, Wood Working Toolkit, Thoroughly Reviewed, Luxury Home Stuff, Top Best 10 Reviews, Cut The Wood, Sawing Pros, Cozy Down Home, Beasts Live and more. Through this analysis, we've determined the best Jigsaw you should buy. In our analysis of 94 expert reviews, the Bosch Bosch Power Tools Jig Saws placed 2nd when we looked at the top 8 products in the category. For the full ranking, see below. Comes with the most power,offers the smoothest,surest cut and is the most versatile jigsaw available. The speed can be changed due to the amount of pressure applied to the trigger. The top handle is an obvious perk for the Bosch JS470E, but another feature is far less evident. That would be the “tool-less” blade ejector.While it can’t shoot the blade across the shop at your foes, it will ensure you will never have to touch a hot blade again. This model has a lock button that’s easy to use whether you are right or left-handed as well. 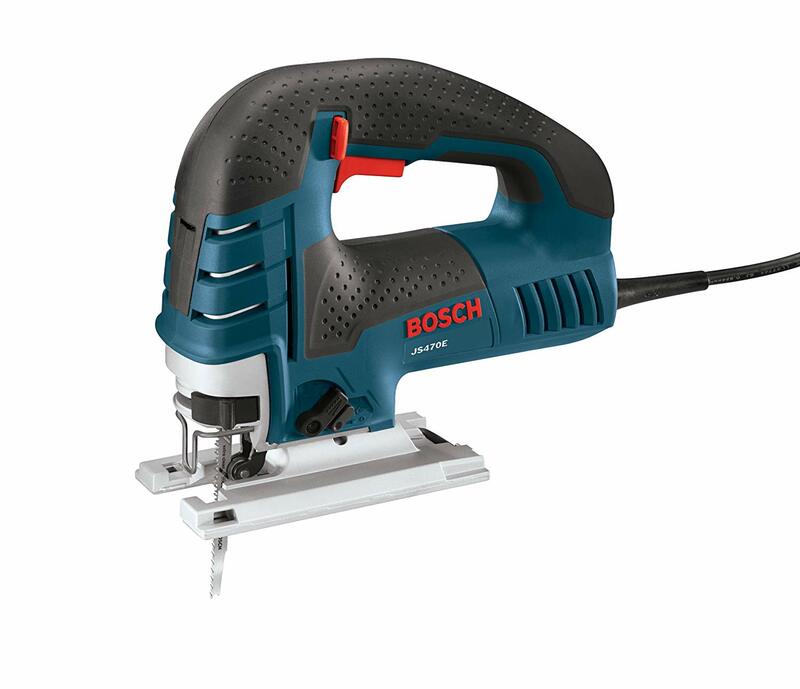 Probably the best option of the Bosch JS470E jigsaw is the tool less blade-change system which allows the user to quickly change a T-shank blade without a tool as well as avoiding touching a red hot blade with your fingers. Thanks to its solid die-cast aluminum footplate and industrial design, this jigsaw can withstand even the toughest work conditions. It has a nice rubber-overmold grip and ergonomic trigger with soft start, immediate response, and its blower was strong enough to keep a cutline cleared of sawdust. The saws variable speed trigger was useful for starting a cut low and working up cutting speed. Once up to speed the JS470E consistently made clean, smooth cuts with no tool vibration. This jigsaw stands out among the rest for its rugged durability (the footplate arm will withstand up to 546 lbs of load) and raw power to tackle most any job you can throw at it with a top SPM of 3,100. It will also bevel up to 45° and can cut through soft wood up to 5 7/8 inches thick. An efficient model of a jig saw with a long power cord. Theres no need to press it long against the work piece. Variable speed and easy-to-use accelerator trigger for instant adjustments. The 7-amp motor delivers variable speeds from 500SPM to 3100SPM for a wide range of cutting applications. We like how the SPM can rise from 0 to 3,100 in an instant, with the push of a button. It’s has a comfortable shape, size and ergonomic to limit hand fatigue. What makes this jigsaw rank in the top three on many review sites is the industrial design that helps it withstand the roughest jobsite conditions without losing power or accuracy. Ambidextrous lock-on button for continuous long cut. This saw features a toothless blade change system with fast insertion and blade ejection. The feature eliminates the hassle in need to touch a hot blade. It features an ambidextrous lock-on button for steady cuts and for the convenience of all its users. A tool-less blade ejection lever is built for ease of ejection without needing to touch the hot blades. You have the freedom to choose multiple blade speeds. One of the perks of the JS470E is that it comes with a handful of great accessories. It comes with a hard carrying case, along with a blade, plastic overshoe, bevel wrench, and anti-splinter insert. On the more expensive end. With this saw, it would be the weight as it’s one of the heavier models we’ve come across. That said, you should not let that rule it out by any means. I really liked the storage location but was disappointed that a tool is needed to bevel. At just over 6 lbs, it’s a heavy saw (which helps to dampen vibration), but it’s not a problem unless you cut overhead. The only issue I had with this saw was the trigger dug into my finger slightly, and annoyed me on longer cuts. There were some negative reviews that complained the blower was underpowered and didn’t move much dust and some had problems with the quality right out of the box. We do wish it had LED track lights for lower-light situations. Requires an additional tool for beveling. It is a little bit on the heavy side at 7 lbs. Higher price compared to other close competitors. High on vibration when used. Has no laser cutting guide or LED light. 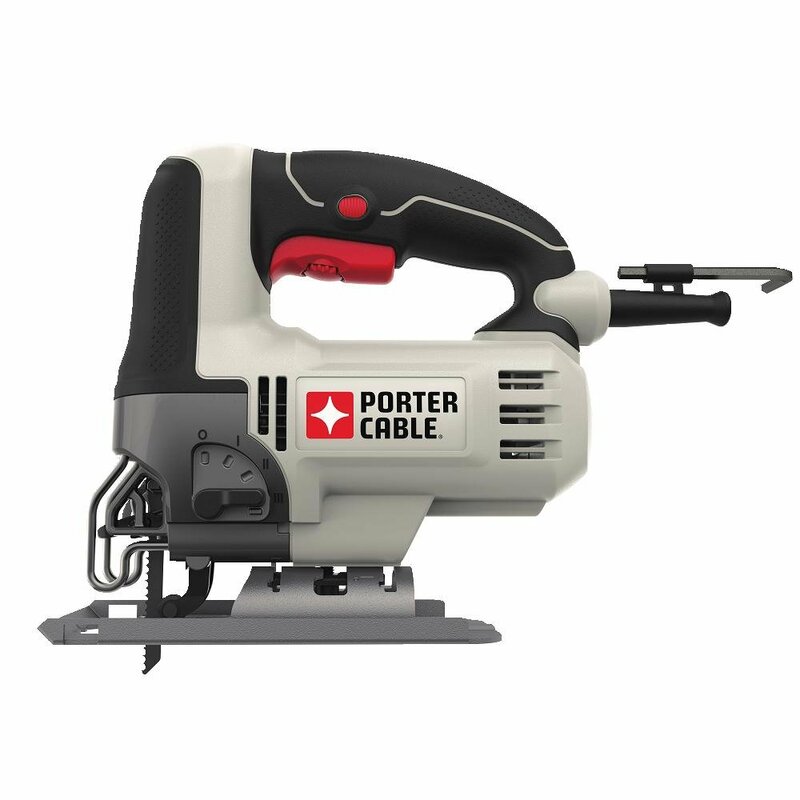 Bosch introduces another essential and practical piece for your power tools collection with our JS470E Cordless Top-Handle Jigsaw with 120V low-vibration, 7.0-amp variable speed for smooth cutting up to 5-7/8" inch on wood, 3/8" inch on steel. Perfect for countertop installation, woodworking, countertop cut-outs, furniture building, professional woodworkers, and DIY projects. Tool-less blade-change system. Ambidextrous lock-on button. Variable speed-dial. Large, sturdy die-cast foot with steel insert. Exclusive multi-directional blade clamp. Internal precision control. Constant response circuitry. 4-In-1 orbital-action settings. Adjustable dust blower. rgonomic top handle, includes a non-marring overshoe. Anti-splinter insert. Blade. Bevel wrench. Carrying case. Our woodworking tools have lightweight handling and accuracy. The variable speed dial sets maximum speed and accelerator trigger controls operating speed. Features an ambidextrous lock-on button for steadiness and user comfort. The precision-machined plunging system and low-vibration design enhances accuracy and allows for the smooth jig saw operation in a variety of jobs. The unit includes one (1) Jig Saw, one (1) Blade, (1) Anti-Splinter Insert, one (1) Plastic Overshoe, one (1) Bevel Wrench, and one (1) Carrying Case. Feel relaxed during jobs as we've thought through all the details. Our JS470E jigsaw is top amp rated, having a prevailing 7.0 AMP motor. In addition, the no-load SMP ranges from 500 to 3,100 and has Up to 60 hertz. Combine power and flexibility with four orbital-action tool settings. Enjoy different blade strokes for smooth cuts on the toughest cutting tasks.